Potatoes have many constituents including a host of tannins, flavonoids, and alkaloids. The tannins have a drying action which has been linked to relieving diarrhea. They have also been used externally for burns and inflammation. In folk medicine, the use of potatoes for bone and muscle pain is partially due to their ability to hold heat for long periods of time, allowing it to penetrate deep into ones tissues. The converse is also true, as they hold cold well and are also used as a compress for treating burns and scalding. Successful experimental treatments for gout and rheumatism have been made in recent years from the juice of raw potatoes and using the vital mineral salts found in the water of boiled potatoes. 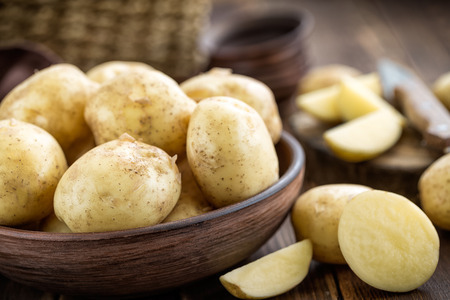 Potassium, sulfur, phosphorus, and chloride in an uncooked potato are useful for treating acne blemishes; while their enzymes and vitamin c can nourish the skin, remove unhealthy tissues and make it younger looking. Folklore claims that an uncooked potato, freshly cut and placed on a wart several times daily, will remove it. This treatment has also been recommended for removing splinters and relieving bags under the eyes. Potatoes should be omitted from the diet of those with venereal diseases and those who are prone to aphrodisiac tendencies as they contains an alkaloid toxin (solanine) which affects the sexual organs. Solanine poison is more prevalent in potatoes too green in color. The combination of cooked meat and the afore mentioned "too green" potatoes cooked intensifies this poisonous actions. Together, with the presence of uric acid crystals resulting from the poor digestion of the meat, they may cause severe irritation of the sexual organs.